Fruit is nature’s bounty and if you cut out processed sweet foods from your diet, it’s a fabulous substitute. With easy to recreate ideas, you can transform fruit from a simple pleasure into something quite scrumptious. Just because fruit is hailed as a staple of a calorie-controlled diet, it shouldn’t be a green light to gorge on the goodies. Some fruits are packed with natural fruit sugars that push them into the higher leagues of calorie-laden foods. A fruit salad seems like a really good choice but a large bowlful could mean the difference between keeping within your calorie targets or shooting well beyond them. Some dieters mistakenly drink endless smoothies without realising that they are consuming surprisingly high calorie totals from the natural, high sugar content. 1 average apple is 50 calories. 1 mango is 107 calories. Average portion of figs is 55 calories. As well as being aware of how much variation there is with the calorific values of fruit, you also need to think about how you prepare or buy the fruit. Fresh fruit is much better than canned or dried fruit and a lot of tinned fruit is served in disastrously over-sweetened fruit syrup. They taste delicious and they’re incredibly healthy. Who would have guessed the unexpected delights of - frozen grapes? When you freeze grapes they take on a texture that makes you linger over them, intensifies their sweetness and gives the fruit’s flesh a rich, creamy appeal. When only chocolate or ice-cream will do, these little treasures are a gift. To prepare them, make sure you rinse the grapes thoroughly. The most important job is ensuring they are thoroughly dried as this will affect the end result. Lay the separated grapes out on a baking sheet covered with a layer of paper towel and freeze for several hours. The grapes will keep for just under a week and once they are fully frozen, you can decant them into small Tupperware tubs ready for easy snacking. 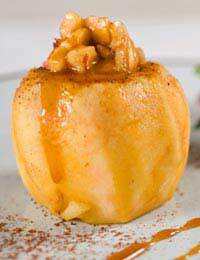 Few things are more comforting than a delicious baked apple, hot from the oven. Take a large sweet apple, clean and core it before placing it in a baking sheet. Your oven will need to be set at about 190C. Mix a tablespoon of dried fruit like sultanas or raisins with a small dash of honey and pile into the core of the apple. A sprinkle of cinnamon is a lovely addition to the fruity filling. Bake the apple for about 45 minutes until it’s browned and bubbling. Serve with some creamy, low- fat Greek yoghurt or good low-fat custard. Even the most luxurious fruit desserts can be quickly adapted into a lower- calorie version. Fill an individual meringue with a dessertspoonful of low-calorie custard and top with strawberry slices for a quick, low- fat alternative to Pavlova. Poach peeled pears in fruit juice, livened up with a splash of sherry or liqueur. Heat gently for about 40 minutes or until tender and serve with low-fat crème fraiche. To give fruit jellies a more luxurious touch; add some juicy fresh berries before chilling the jelly to set. So pick the right fruit, with good portion control and a tempting recipe and you can’t go wrong. Fruit need never be boring, with a little trial and error, it’s an endless source of delicious treats.